When the Iranian Navy announced that its forces had foiled a hijacking attempt by eight boatloads of Somali pirates off the coast of Yemen earlier this month, it was held up as an example of how naval commandos could successfully protect remote Iran-chartered cargo ships. That announcement, delivered on September 10, came just days after the government in Tehran revealed that it was sending a naval surface ship and a submarine into the Red Sea -- in an echo of another multiple-ship mission during the summer that was hailed by Iran's official media as the "first such operation by the country's navy in far-off waters." More headlines are sure to come. 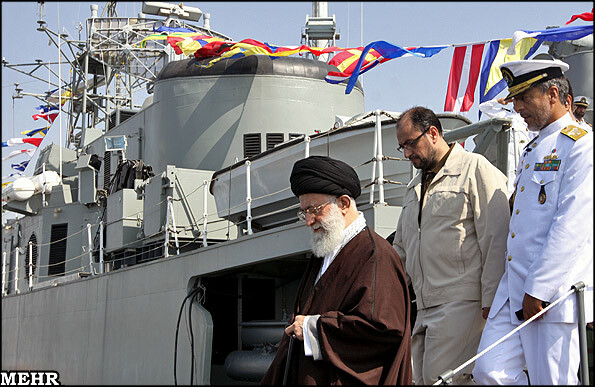 Iran's leaders have declared their intention to boost their presence in regional waters and beyond. They are talking up their naval capabilities and declaring their ambition to stage more operations far from the country's territorial waters. Tehran is not being coy about the motivation for all this activity: to impress other regional powers with Iran's growing influence and to undercut the American military presence in the waters around Southwest Asia. "The days of hegemonic powers which determined the fate of other nations with their military presence have come to an end," said Ayatollah Ali Khamenei, Iran's supreme leader, in a speech to naval personnel in the port of Bandar Abbas several weeks ago. "[Iran] will impose its resolve on any military and political power and force them to retreat." He called the presence of U.S. and European ships in the Persian Gulf "detrimental and unwarranted" and said the region's seas remain independent "due to the powerful presence of the Islamic Republic of Iran." The Iranians are underscoring this message by showing off new cruise missiles and torpedoes. Meanwhile, the commander of the navy has vowed to dispatch ships to the Atlantic Ocean if the occasion demands and declared the aim of keeping vessels on continuous station in the Mediterranean Sea, the Suez Canal, and the Indian Ocean. Analysts urge skepticism, however. 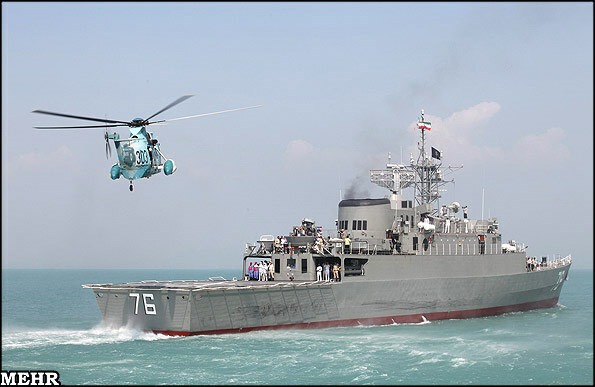 In its current state, they say, the Iranian Navy simply does not have the capacity to live up to these ambitions. Most of its oceangoing surface ships are more than 40 years old, and Tehran is struggling to keep them operational. Over the past few years the only major ships the government has managed to add are one home-built destroyer and three Russian-made submarines. But this doesn't mean that Iran's ambitions are entirely unfounded. The real thrust of Tehran's new strategy, observers say, is more political than military. Iran, they say, is trying to capitalize on what it perceives as diminishing U.S. influence in the region. That view draws on the seemingly unwinnable NATO-led effort to stabilize Afghanistan, the impending withdrawal of U.S. troops from Iraq and the rising influence of pro-Iranian political parties in governing circles in Baghdad, and the rising influence of Iranian-backed Hizballah in Lebanon, among other factors. Tehran is trying to build on these developments by promoting regional cooperation in the establishment of a security system that would exclude the U.S. Navy from the Persian Gulf and adjoining waters. But this, says Michael Connell, director of the Iranian Studies program at the Center for Naval Analyses in Washington, could be easier said than done. "The Iranians would like the Arab countries to reach out to Iran and participate in some kind of security arrangement," Connell says, "but there is no appetite whatsoever on the part of Arab countries, particularly the ones on the Gulf. The whole reason the U.S. is there is because the Arab countries in the Gulf feel that without the U.S. there it will alter the regional balance of power against them and in Iran's favor. So for the time being, the U.S. is acting as security guarantor." In fact, Connell and other analysts say, shared concerns about Iran's nuclear ambitions are actually bringing the United States and the countries of the Gulf Cooperation Council (GCC) -- which includes the Arab countries adjacent to Iran -- closer together. If anything, continuing progress in Iran's nuclear program and the uncertainty caused by the Arab Spring is likely to intensify calls for a greater U.S. presence in the Persian Gulf. Tehran's criticism of the GCC intervention against Shi'ite-dominated protesters in Bahrain earlier this year has done little to endear Iran to its Arab neighbors, some of whom accuse it of abetting antigovernment demonstrations there. "Unless there is major political change in any of these countries, by and large, the general thrust would be to further tie in the relationship with the United States and to deepen the U.S. involvement in the security of the region," says Michael Eisenstadt of the Washington Institute for Near East Policy. Some of Iran's naval maneuvers accordingly seem to be aimed more at cementing diplomatic relationships than bolstering military prowess. In February, two Iranian naval vessels docked at the Syrian port of Latakia in an effort to bolster Tehran's relationship with one of its closest regional allies. Connell says such visits are calculated to boost Iran's prestige. "It allows them to show and plant the Iranian flag in places where it's never been planted before," Connell says. "There is a diplomatic component to it. For instance, a lot of these deployments involved are port visits where Iranian vessels will dock in a foreign port and the personnel will get out and will go to a conference and they will engage in naval diplomacy. Part of it is to advertise the navy's capabilities, to demonstrate that the navy has achieved technological advantages perhaps the rest of the world might not be aware of." Making port calls is part of Iran's effort to "support its narrative as a rising power," says Eisenstadt. "But these visits are short-term visits. These are small numbers of ships that would be vulnerable in the event of a military confrontation," he says. "So it is mainly again propaganda and power projection to try to create this image of Iran as a rising power, [of] intelligence-gathering, and also to train their naval elements to operate far from their normal areas of operation. "But it will be a long time before they can operate on a sustained basis far from the shore, never mind projecting power in a significant way far from Iran. So it is more to build an image than there being a kind of substance or actual capabilities behind these deployments." There is little doubt that there is a major gap between Iran's intentions and its capabilities. As for extending its operational range to the Atlantic Ocean, it is beyond Tehran's capabilities, "at least for the foreseeable future," says Connell. "If you look at Iranian military developments, there is a lot of bluster and a lot of exaggeration," Connell says. "It is messaging. They are trying to say, ‘We are extremely capable. You'd better watch out. 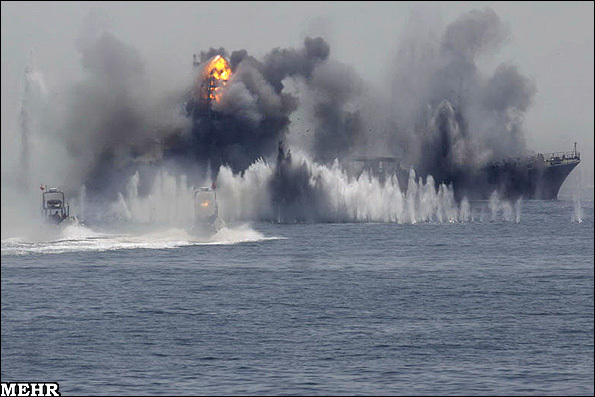 The Iranian Navy is coming to your neighborhood.' But a lot of it is bluster."